Ernie Lanigan (1873-1962): "No man, living or dead, did as much for baseball research as the diligent, untiring, ever-searching Ol' Ernie," said Fred Lieb, himself a Henry Chadwick Award honoree. Ernest John Lanigan, known to all as Ernie, was born in Chicago on January 4, 1873. He got his first job in baseball at age 15, when he went to work for his uncles, Al and Charles Spink, founders of The Sporting News. Except for eight years working in a bank, Lanigan spent the rest of his life in baseball. At various times he worked for the New York Press, the Cleveland Leader, the St. Louis Cardinals, and the International League. He is credited with publishing baseball's first encyclopedia, in 1922, which he updated annually through 1933. He compiled RBI statistics for 1907-19 and Caught Stealing data for 1912-19 at a time when no was else was doing so. 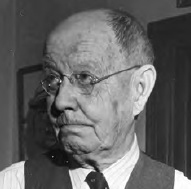 From 1946 until his retirement in 1959, Lanigan served as the curator of the National Baseball Hall of Fame and Museum and later as its historian. He died in Philadelphia on February 6, 1962.